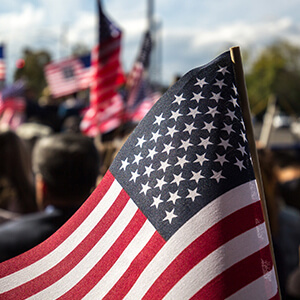 Last week, the Center for Public Integrity (CPI), a news outlet biased in favor of greater political speech regulation, touted recent polling by the University of Maryland’s “Voice of the People” initiative. 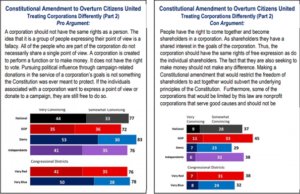 In their story, CPI specifically highlighted results showing that a large proportion of respondents support certain regulatory policies, such as a constitutional amendment to overturn Citizens United, greater disclosure requirements for nonprofit advocacy organizations, and tax-financing of political campaigns. By and large, these results hinge on poll questions that are either excessively subjective or dubious. 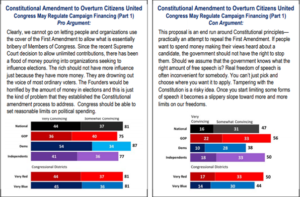 Polling for campaign finance issues is tricky, and the authors acknowledge this: “For this type of topic, standard polls are inadequate as few citizens have sufficient information about the legislative proposals to provide meaningful input.” To account for this knowledge gap, they provide an assessment of each policy proposal, plus arguments in favor and against. Respondents were then asked their opinions on the overall proposal and each set of arguments. 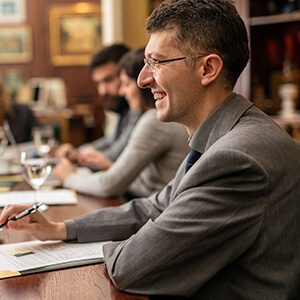 Throughout, the authors repeatedly use loaded words and phrases that explicitly frame the issues in terms that are most favorable to pro-regulation groups. They state the goals of speech regulation as “reducing or counterbalancing” the influence of all sorts of supposedly unsavory groups: big campaign donors, special interests, corporations, and the wealthy. 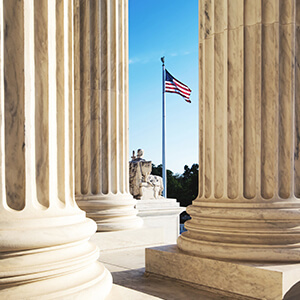 Left unstated is how political speech regulations burden the rights of other groups – such as advocacy organizations like the ACLU or National Right to Life Committee, or smaller nonprofit corporations. (Indeed, the constant use of “corporation” suggests that large, for-profit businesses are bigger players than they are – most super PAC funds, for example, come from individuals, not businesses.) The word “nonprofit” appears only once in the questions. Below is an analysis of the poll results from three major issue areas. This is meant to be a neutral assessment of the amendment, but the usage of “set reasonable limits” – which comes from the text of the proposed constitutional amendment – already heavily influences the outcome of the question. After all, who would be against “reasonable” limits? The poll doesn’t demonstrate what exactly “reasonable” means and who gets to decide. 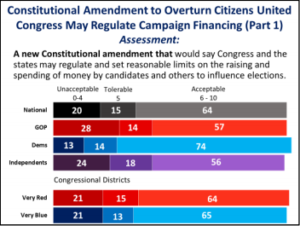 In fact, this proposed amendment would go far beyond overturning Citizens United, since limiting candidate spending goes against the 1976 decision, Buckley v. Valeo. 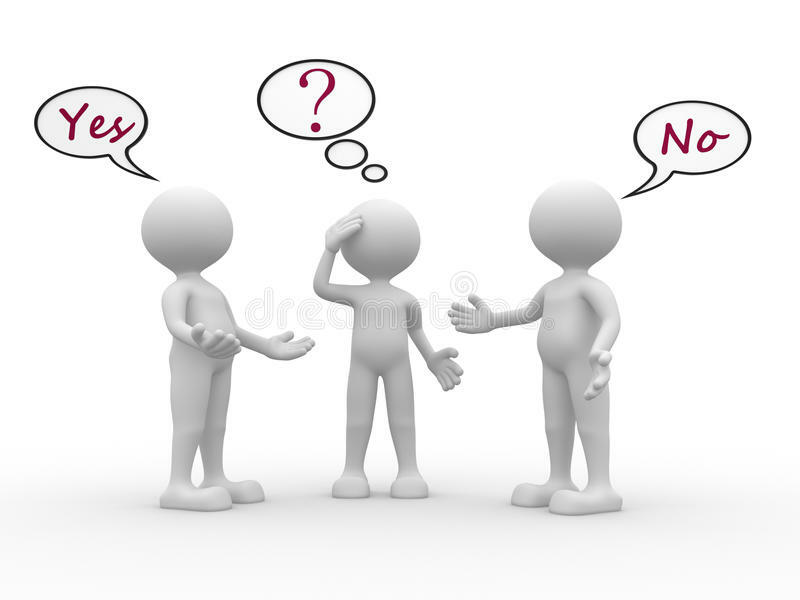 Within these sample arguments, outright misstatements of fact are presented as mere differences of opinion or allowed to stand without rebuttal. Some of the dubious claims from the “pro” side that go unchallenged are: that independently spending money on political ads is “essentially bribery”; that Citizens United allowed “unlimited contributions” (there are still rigid contribution limits for giving to candidates, parties, and PACs, and corporations are banned from giving to federal candidates entirely); that the rich have “more influence” because of ad spending (in fact, free speech does not “drown out” others’ voices); and that political spending would be “horrifying” to the founders (who essentially spent money on booze-fueled bangers to win over voters in early American elections). The “con” arguments directly address few of these questionable claims. One “con” argument points out that “some” corporations are nonprofit groups (in fact, so-called “dark money” comes entirely from nonprofits) while inexplicably fixating on the free speech of “shareholders”, rather than members and supporters of advocacy groups. These arguments make no mention of the benefits of political spending for participation in elections by non-politicians, nor do they reference the federal government’s arguments during Citizens United that it could prevent the distribution of movies or even books during elections. Both sets of arguments do a poor job of conveying key facts to respondents. 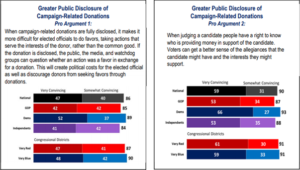 First, characterizing the disclosure debate as being about “campaign-related” donations is strongly misleading. The vast majority of political spending already comes from groups that disclose their donors – upwards of 95% in any given year after Citizens United. 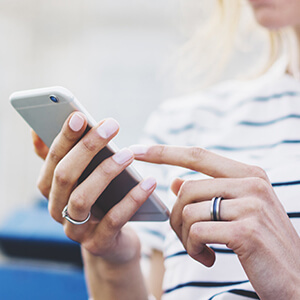 Donations to political entities as low as $200 require a donor’s name, address, occupation, and employer to be posted on the Internet in a publicly searchable government database. Yet few are arguing for getting rid of disclosure of donors to candidates, parties, PACs, or even super PACS. 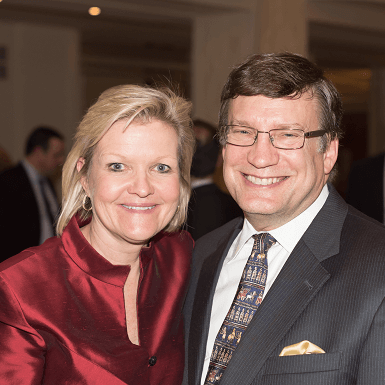 Rather, the argument is that giving to nonprofit groups – which, by law, cannot be primarily political – is not “campaign-related” and that these donations should accordingly remain private. Second, disclosure often does little to inform the public about a politician’s relationships. For the most part, disclosure information is misused by activists trying to push an agenda, or journalists who do not understand campaign finance law (e.g. saying that a politician received $X from a big oil company, without pointing out that this money actually just came from that company’s employees). 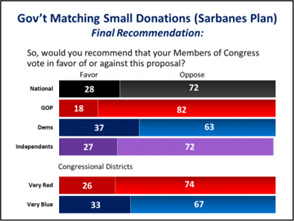 Third, the arguments – even those for the “con” side – take as a given that elected officials regularly change their policy views to favor donors. For this claim, there is a persistent lack of empirical evidence. 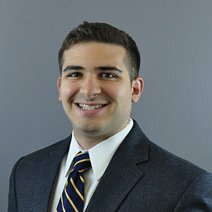 The more likely explanation for campaign donations – that donors support politicians because of their views, rather than lawmakers altering their views based on their many and varied donors – is puzzlingly treated as a mere rationalization for corrupt politicians to escape public blame. The “con” arguments don’t emphasize the benefits of donor privacy, or even use the term “privacy” at all. They essentially repeat the same premises as the “pro” side without offering even the most common rebuttals. A final issue area touching on free political speech is taxpayer-financed campaigns. 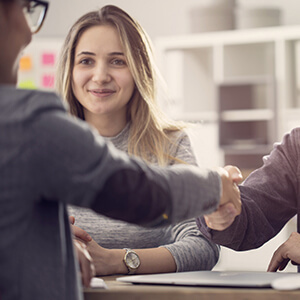 Supporters of this policy believe that government funding of candidates can improve the quality of politics and government by enticing candidates to voluntarily accept otherwise illegal restrictions on their campaigning (such as spending limits). 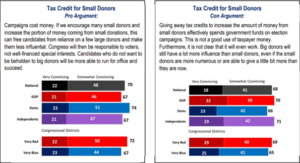 To the contrary, the Institute’s research has debunked a large number of the purported benefits of tax-financing: taxpayer-funded campaigns do not limit the influence of lobbyists or special interests, alter legislative voting behavior, increase gender or occupational diversity of lawmakers, improve voter participation, or foster electoral competition. Worst of all, tax-financing schemes force Americans to subsidize candidates with which they may disagree. Again, this phrasing does not challenge the underlying assumptions of pro-regulation activists, yet still deals a blow to their policy proposal. Even more interesting is how polling changes when it is made explicit that taxpayers would be paying for these payments to politicians. 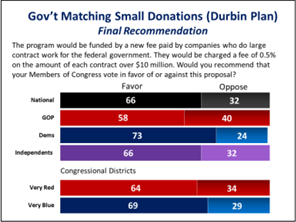 There are poll results for two different tax-financing plans whereby the government provides “matching” payments to campaigns based on how much private fundraising they can raise. The “Durbin Plan” would fund these payments with a fee on government contractors, while the “Sarbanes Plan” would draw the funds from general government revenues (i.e. from taxpayers directly). The results show how opposition skyrockets when it becomes clear that ordinary citizens would bear the burden of this policy (as they already do in the vast majority of tax-financing programs nationwide). These three issue areas only represent some of the policy proposals that were polled, but it is striking how opinions change dramatically when the costs of policy proposals to ordinary citizens are made clear. 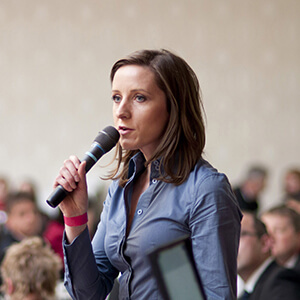 Given the lack of background these questions provide on political speech issues – issues where a great deal of misinformation and stigma already exists in the public sphere – one should wonder if the polling results would hold up among those given a full and accurate impression of whom campaign finance policy most impacts. 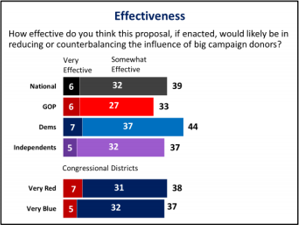 Remember, “few citizens have sufficient information about the legislative proposals to provide meaningful input,” and this polling does little to resolve that issue.